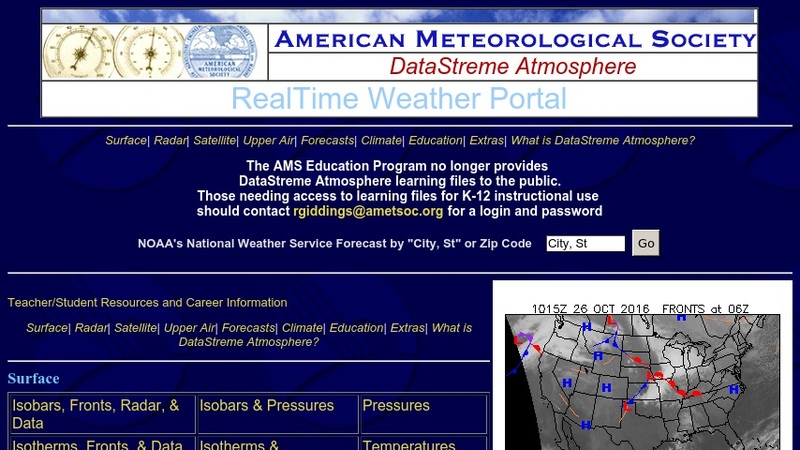 DataStreme Atmosphere is a teacher-enhancement initiative of the American Meteorological Society (AMS), for training Weather Education Resource Teachers who can then promote the teaching of science, mathematics, and technology using weather as a vehicle, across the K-12 curriculum in their home school districts. The first step in the training is participation in a 13-week distance-learning course offered twice a year to selected applicants, for which those who successfully complete course requirements receive credit (for a 3 semester-hour graduate course from the State University of New York, Brockport). The web site features information on the program and course resources such as daily weather summaries, news items, and current weather studies. There are also weather products, including maps of surface conditions, radar and satellite imagery, upper-air conditions, watches and warnings, and other data. Other materials include a user's guide for the course, a glossary, blank maps and worksheets, a directory of weather-map symbols, and other items.